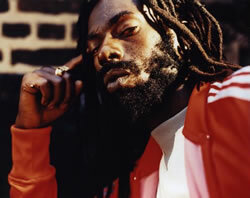 New York, NY (Ms. RAINE INC.): Dancehall and Roots Reggae legend Buju Banton will be joining Dancehall’s latest luminary Mavado at the renowned Ritz Theatre in Elizabeth, New Jersey on Sunday, October 26th. This unprecedented event, now dubbed Reggae at the Ritz, will be the first time that the swanky ‘uptown’ Ritz was hit with Jamaica’s ‘downtown’ Dancehall vibe. With his signature gruff voice and sharp-edged lyrical delivery, Jamaican music icon Buju Banton, also known as ‘Gargamel,’ hits the Ritz with a nearly 20 year catalogue of some of Dancehall and Roots Reggae’s biggest anthems including “Bogle,” “Browning,” “Walk Like a Champion,” “Wanna Be Loved,” “Untold Stories,” “Driver A,” and “Too Bad.” Banton has released seven albums including Dancehall classics Voice of Jamaica (1993), and 2007’s Too Bad, and his signature album 1995’s Roots/Dancehall masterpiece ‘Til Shilo. Mavado, whose “Gangsta fi Life” persona and haunting sing-jay vocal style has made him the most infamously famous of Dancehall’s latest generation of deejays, brings the ‘gully’ side of Dancehall culture to glitzy Ritz. Earning international attention with bitingly gritty tunes like “Weh Dem A Do,” “Last Night,” and “Gully Side,” Mavado’s debut album Gangsta For Life: The Symphony of David Brooks spent 48 weeks on the Billboard’s Top Reggae Albums chart. His latest hit singles “So Special” and the “On the Rock” remix with Hip Hop mogul Jay Z, are currently in heavy rotation on mainstream stations around the globe. Reggae at the Ritz will be held at the Ritz Theatre (1148 East Jersey Street) in Elizabeth, NJ. Advance Tickets are $39, $59, $79, and $99. For ticket information, go to www.ticketmaster.com. For VIP Tickets, call 908-222-1519, or 973-573-8154. For a full listing of ticket outlets, log on to www.streetz96.com and www.roadblockradio.com, or call 973-573-8154. For artist interviews or media inquiries, contact Ms. Raine Inc.’s Media Relations Department at media@msraineinc.com.